A. THOMSON, Photographer, Tahatika, will be at Owaka Township on Wednesday, 19th, Thursday 20th, and Friday 21st. Hours 9 to 5. Terms cash. Prices— Full sized Cabinets from 10s 6d a doz. First-class assortment of Catlins and surrounding district scenery for sale. (Premises lately occupied by Mr W. R. Millar). PHOTOGRAPHS in various styles and on ornamental mounts from midgets to 15 x 12. Homesteads, groups, and animals taken in any part of the surrounding districts. Enlargements supplied from any photograph in black and white, opal, oils, or water colors. GEM POTOGRAPHS (sic) taken in four different positions — 16 for one shilling. Special inducement for one month only. — Each purchaser of one dozen 15s cabinets will be presented with a beautiful black and white 12 x 10 enlargement, handsomely mounted; price, 15s. All work finished at the shortest notice in the latest styles. Having had a long and extensive experience in all branches of photographic work, absolute satisfaction is guaranteed. Mr A. Thomson, photographer, Lawrence, met with a nasty spill coming down Raes Junction Hill the other day. He was just approaching an ugly bend in the decline, when his chain slipped off and his bike got out of control. Fortunately he struck a rut, which upset him before the most dangerous point was reached, and he escaped with a severe shaking and a few scratches about the face. A special platino matt bromide enlargement, handsomely mounted on a 14 x 18 mount, will be presented with each dozen. Proofs submitted to each customer, and two positions to choose from. Satisfaction guaranteed to all who have never had a good photograph. Studio open only 2nd and 4th week in each month; 1st and 3rd week at Millers Flat. The above pictures framed at Dunedin PRICES. Call and inspect samples of mouldings. Notice appears in the last issue of the New Zealand Gazette that Alexander Thomson, of Alexandra South, late of Lawrence, photographer, was adjudicated a bankrupt on his own petition in the District Court at Naseby, on the 4th instant. A meeting of creditors in the estate of Alexander Thomson, photographer, of Alexandra, was held before the official assignee (Mr W. S. Fisher) on Tuesday, 15th inst. The bankrupt's scheduled statement showed total debts £157 17s; asset, £22 13s consisting of book debts (£l2 12s) and furniture (£10). The principal unsecured creditors were Wilkie and Co. (£30), P. Hayman and Co. (£20), Smith and Smith (£l0). 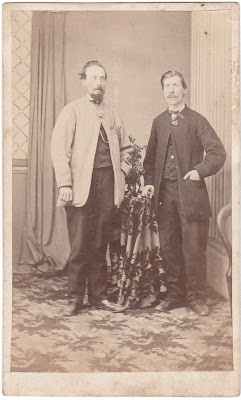 Ahlfeld Bros. (£5), Ward Bros. (£25 5s). The amounts due to other unsecured creditors, 24 in number, ranged from £6 downwards. The bankrupt's statement showed that he commenced business at Lawrence in 1902 with about £25 capital. The expense was too heavy, and his affairs began to go back steadily. He tried hard to get out of the place, but had not the necessary money. In 1908 he left Lawrence for Roxburgh, and thence went to Alexandra. Little business offered, and when an order on a judgment summons was taken out he was compelled to file. He had a wife and family dependent on him, and had a struggle to make a living. He had not the money for his fare to Dunedin, so could not attend the meeting. The case was regarded as hopeless, and the meeting broke up without passing a resolution. 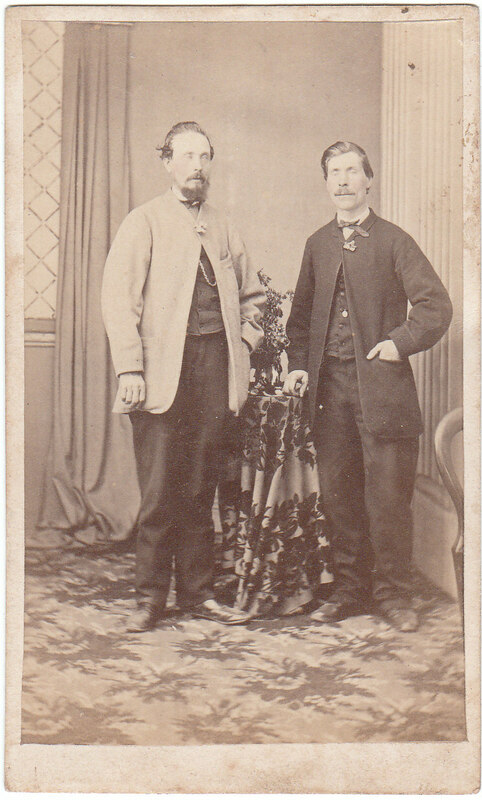 above - a photograph copied by Alexander Thomson of an earlier carte de visite by Joseph Weaver Allen. 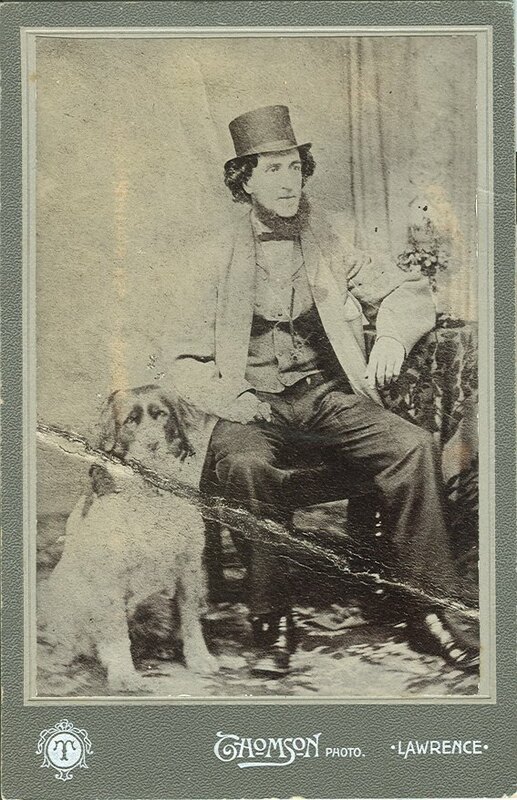 The sitter is believed to be James Lawrie Oliver. The studio setting particularly the patterned table cloth and carpet indicate this was taken in Allen's studio - see the carte de visite below.